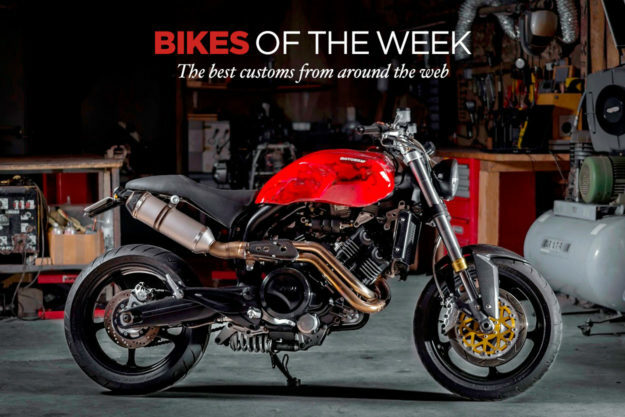 This week, we’ve got three classic cafe racers, a Honda Dominator scrambler, and a fire-breathing Voxan. Which one would you put in your garage? 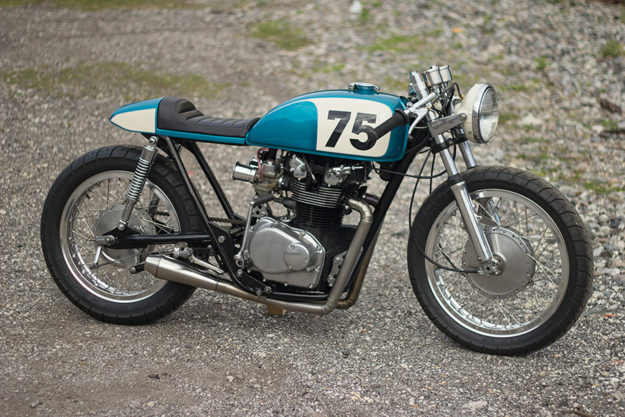 Honda CB500T by The Corner Garage This Miami shop specializes in working on vintage Japanese bikes, and while they’re happy to breathe life back into old iron via restoration, their custom creations are something to behold. The latest is this 1975 Honda CB500T—the simple and clean kind of cafe racer that makes the style so everlasting. The stance is absolutely spot on. The Excel aluminum rims are and beefy and high-shouldered, and the custom work on the seat and tail flows perfectly from the Honda’s tank. A small 4-cell battery has been fitted, along with a custom wiring harness to keep the spaghetti contained—but most of the mess was eliminated with a kick-start only conversion. Aluminum was used throughout the build to keep parts light and add visual interest, the velocity stacks, billet triple and motor mounts all being standouts. The exhaust is a custom 2-into-1, stainless steel set-up, welded to follow the downtube’s lines near perfectly. The white on blue paint is absolutely gorgeous too and was mixed and shot by some nearby friends at Magic City Customs. Voxan by Motorieep If you frequent this space, you’ll immediately recognize the signature of Pierre from Paris-based Motorieep. His handiwork with the now defunct Voxan motorcycles never fails to impress. We’ve seen both his cafe racer and scrambler versions of the Voxan before, and now we’re drooling over this one too. Pierre tells us that this build is what he believes the Voxan factory would be cranking out today, had it not disappeared. That means the lines are contemporary, with a focus on rider ergonomics to maximize the smiles per mile. And there will be plenty of those, given that the incredible 123 horsepower V-twin powers a bike weighing just 379 pounds (171 kilos). 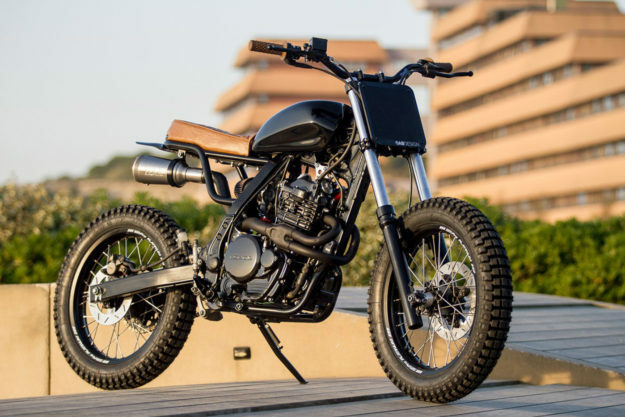 Honda Dominator by Dab Design Simon Dabadie may not be a household name (yet) but you’ve no doubt been intrigued with his work before. 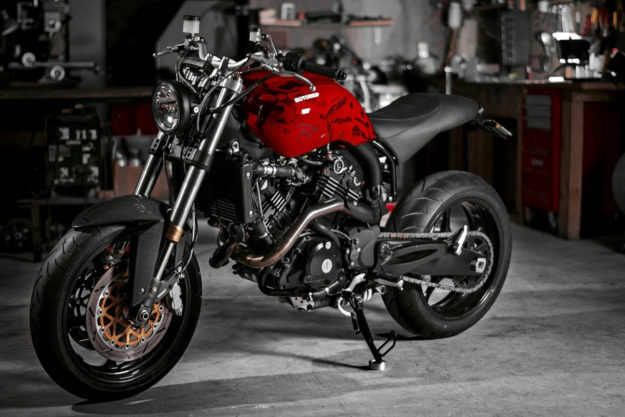 As a 3D designer he has printed and prototyped parts that have appeared on bikes by Roland Sands, the house of Deus and Holographic Hammer, to name a few. His shop in Bayonne, France is now creating a series of Honda Dominator based builds that are spec’d by customers. Working from a 3D scan of the donor bike, Simon creates a photo-realistic rendering for his clients to work with. Simon then tweaks the digital dream bike to match desires and then the hands get dirty. LM #2 is the second iteration to roll out of Simon’s shop and it ticks a lot our favorite boxes. Honda CB750 Nighthawk by Industrial Moto Industrial Moto is a relatively new shop based in Culpeper, Virginia, and aims to make affordable customs that don’t skimp on the details. 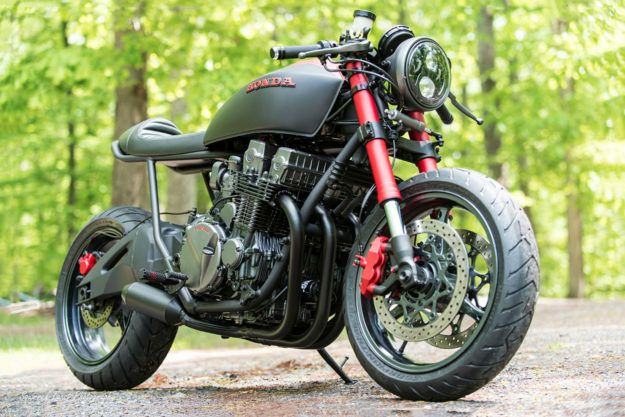 Its latest project is this performance-focused Honda CB750 known simply as Project Scorpion. Working from a well-ridden 1992 CB750 Nighthawk, the team decided they wanted a corner-carving cafe as the end result. A 2006 Gixxer was robbed of its front end and its mono shock swing arm was fitted up as well. This not only improved suspension and stance, but also allowed for better brakes and beefier rubber. To make sure those components weren’t wasted, the Honda powerplant was completely rebuilt with all new seals, bearings and gaskets, and the carbs were rejetted too. The air intake sitting on top them is a hand milled aluminum unit. Paul Tremmel’s BMW R100 café racer The story of the builder of this BMW is arguably even more interesting than the bike itself. It involves adventures through Africa with the United Nations, a short time in London as an investment banker and a stint mining gold in the Congo. But regardless of where he was or what he was doing, motorcycles remained a constant in Paul’s life. 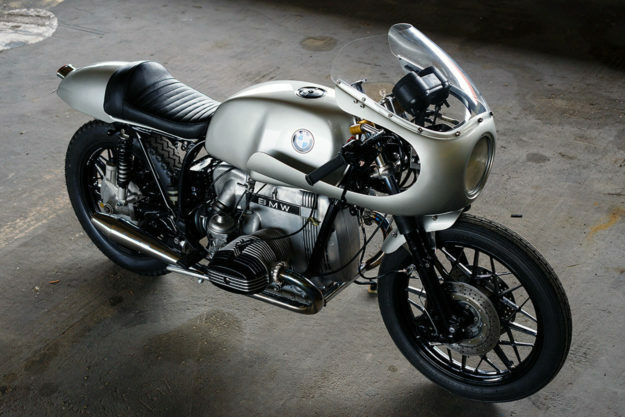 This R100 is the result of Paul’s focused energies to conquer myocarditis (which he contracted while in the Congo) and a barn find of a couple boxers in need of his attention. Working with the two bikes, the best bits from each were plucked for this cafe racer and Paul customized from there. The subframe needed some tweaking to deliver a balanced stance and to work with a new rear cowl sourced from Flat Racer. Much like the gorgeous front fairing though, Paul needed to modify and trim a few bits to get the look he wanted.